The city of Modi'in-Maccabim-Re'ut has maintained its first place position as the city with the largest number of residents enlisting in the IDF, soldiers in combat units and IDF officers – both men and women. The data were revealed in a report published by the IDF's Manpower Directorate on Thursday. The list, which includes 66 towns and cities, puts Tel Aviv in 52nd place and Jerusalem in 62nd place. The data were put together based on three parameters: percentage of enlistment in the town, percentage in combat units and percentage that go on to become officers. The first counts for 50%, the second and third each count for 25%. Modi'in-Maccabim-Re'ut leads with a combined score of 64.7%, followed by Ness Ziona with 58.8%, Ariel with 58.7% Yehud-Neve Efraim with 58.6% and Hod HaSharon with 58.6%. Tel Aviv takes 52nd place with a combined score of 47% and Jerusalem comes in at 62nd place with 35.3%. The bottom three of the list are Modi'in Illit, Beitar Illit and Bnei Brak. The biggest change was registered in Kiryat Motzkin which jumped 19 places from last year to seventh place with a score of 57.9%. Yokneam Illit also marked a major rise – jumping 14 places to eighth place with a score of 57.9%. Dimona also moved up in the ranks to 22nd place with a score of 53.5%. The data released in the Manpower Directorate's briefing paint a grim picture for the future in which by 2020, 60% of all citizens in Israel over the age of 18, including Arabs and haredim will not be enlisting to the IDF, and out of those who are obliged to enlist, only 64.1% will. District wise, the enlistment rate in the Central District among those obliged to enlist is the highest (82%), the Dan Subdistrict (without Bnei Brak) stands at 76%, with the national average at 74.5%. As for combat soldiers, the district with the highest percentage of combat soldiers (who spent the majority of their military service in a combat unit): The Judea and Samaria District gets first place with 61%. The national average is 44.2%. The only other two districts who received above average scores are the Jerusalem District (52) and the Northern District (50). The district with the smallest number of combat soldiers is the Dan Subdistrict (36%). 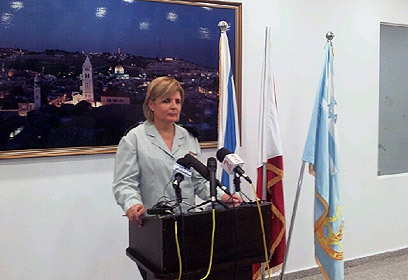 Manpower Directorate Chief, Major General Orna Barbivai presented the findings at a 2011 overview. She expressed concern over the high percentage of women who do not enlist and noted that in three years the numbers are set to hit 41.4%. Of the women who do not enlist, 35% cited religious grounds, though the IDF believes that seven percent received false exemptions. Yet the IDF also commended the growing number of haredim who serve in the IDF. In the current year 1,200 haredi men enlisted in the National Service program (Sherut Leumi) in addition to the 450 haredim who enlisted in the special haredi infantry regiment and 650 haredim who enlisted in various designated service programs. See all talkbacks "IDF: Tel Aviv, Jerusalem last in enlistment "